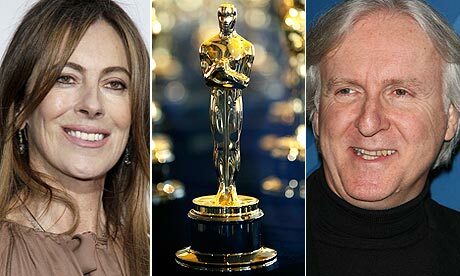 Hurt Locker's Kathryn Bigelow (left) and Avatar's James Cameron have been deflecting the bitter-ex storyline as their films clash at tonight's Oscars. The Academy is a self-conscious bunch. Their crown-jewel event, the Oscars, has been plagued by less-than-stellar TV ratings and suggestions of irrelevance, and the buzz has been getting to them for some time. Their annual attempt at reform this year brings about two more drastic moves, which actually return to the ceremony’s roots: For one, the Academy expanded the Best Picture nominee field from five to ten, breaking a 66 year precedent in an attempt to maybe bring some more popular films into the fold. And this year, presenters will open the envelopes to “And the winner is…” after a 22-year hiatus. Substantive changes? No, not really, which isn’t surprising on the second count, but speaks more to the impact of the first — for all the fear about the irrelevance of the Oscars, it isn’t clear that any more eyeballs will watch Kathryn Bigelow or James Cameron accept their Oscars tonight than in years past, despite all the finickiness and self-conscious revision. Picture: Hurt Locker. This race is as good as a coin-flip at this point anyway. Still, by making this pick, I’m eating some earlier words. Even if it doesn’t win, I could end up eating them anyway, given that some Avatar insiders say they are bracing for a night that could be fairly depressing, and it could be fairly depressing because of Hurt Locker. The comparisons to Titanic make it hard to pick against a film that (in the words I’m now eating) “looks, walks, and quacks like a Titanic, just as everyone wanted it to.” But unlike Titanic, going into the ceremony, Avatar is withering and never sustained any inertia and would need a late vote push by all accounts to beat Locker. That doesn’t change the fact that I think Bigelow’s film is the best feature film I’ve seen all year, and I think it absolutely deserves the award tonight. Director: Kathryn Bigelow, Hurt Locker. The self-conscious Academy is going to give the award to a woman, probably because she’s a woman. The gender politics of that are kinda screwed up, and I’m not endorsing them, but simply using them to make my prediction. And I’m not proud to say it, but I think James Cameron should get this one for the creative vision that drove Avatar. Actor: Jeff Bridges. It should be hard to pick against Colin Firth in his turn in A Single Man — but this year, Bridges makes that pick very, very easy. Actress: Carey Mulligan. There’s always a surprise, and I see Sandra Bullock as the weakest of all the locks. I should note I’m making this pick against my better judgment, simply because the mechanics of the voting process really work against Mulligan. But I don’t see this as Meryl’s year to swoop in from behind, and Mulligan pulled off the greatest feat this year in An Education, a film that needed strong, nuanced acting to save it. Supporting Actor: Christoph Waltz. I’m worried this may be the only award Inglourious Basterds takes home, despite my Screenplay pick below. Supporting Actress: Mo’Nique. She’s a shoo-in, slam-dunk. Silly not to pick her. Original Screenplay: Inglourious Basterds. This race is a tough one to call between Inglo Bast and Hurt Locker but I think we can turn to the self-conscious Academy again for some answers. Locker, a film predicated on its authentic intensity, is getting panned late for some inaccuracies in its portrayal of military personnel and procedure. Since Tarantino is getting closed out of the Best Picture and Best Director talk, I think this is where the Basterds get their due. But aside from BP, this is my least-sure pick. Adapted Screenplay: Up in the Air. More of a sure-thing than it’s Original counterpart category, but you can’t exactly close out Precious or An Education.